Hi, alpha-prime -- I checked everything you mentioned. sysstatscom.dll was in \ObjectDock, where I understood we were to unzip the file; all the others were correct. So I moved sysstatscom.dll to \docklets\sysstats. Right-clicking the blue question mark and then choosing Load brought up world.ini; clicking that did nothing. Then I tried it with sysstatscom.dll in both \ObjectDock and \docklets\sysstats at the same time with the same result. My copy of the original ObjectDock is under Program Files and is not open. ObjectDock Plus is under Stardock\ObjectDesktop. I'll take out the original program, and see if that helps. I can't understand why others were able to unzip and use immediately. Your clock is awesome, but I tackle a problem. With MSXML4 I managed to load clock to ObjectDock with no crash, but whatever I do, no matter what city I choose, there's only Groton, MA on the background (clock title changes still) and it's always 10:52 AM. I can't figure out what I need to do to make it work corretly. I installed the clock, but it doesnt work... It always shows 10:52 Am, even when I change the place. How can I get it to work? I've the same problem of Greenglade. Why my clock is Black? Where is the world? Well... the clock now works, but it's black! 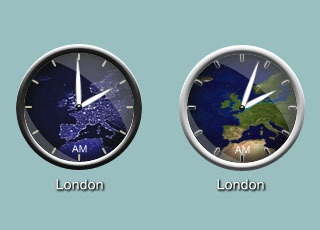 IS there any way to have the world clock display the time digitally above it instead of the location? I stink at reading analog clocks, but this one is so nice! Well...I've three world clock: Los Angeles, New York and Tokyo... but all have a black backgroung instead the world map of the location. For those who still have the problem of the black background: I had it myself and I found the solution elsewhere on the internet. It seems the World.vbs script had to be adjusted. With thanks to AndreasV. Const feedName = "Data Feed"
is there a way to make the label an hh:mm display instead of just saying the location? I have installed the clock, but I dont know how to put a new location. I dont know where to right click... I can only see Groton ! The instructions are up in the description. Use ctrl-click. I build GIS (Geographic Information Systems) data for a living (and I am a Land Surveyor) in Florida so I love anything that uses globes or maps. I was thrilled to see that you are re-centering the image to the users location (ctrl-click icon and change your zip code). That is very slick!!! I love your work. keep it up and have fun with it! I wasted a day to install this world clock and I failed to change the location, the longitude/latitude, the time zone or anything else, because it restores all in a second. Find two files named SysStatsCOM.dll and Hook.dll in SysStats folder or somewhere else, and then copy them into ObjectDock folder.